Build a cave with a terrace on top for your aquarium! Use air-drying clay to make a template of the structure. Let the clay dry, then cover it with several coats of silicone rubber to make a mold. Remove the mold from the clay, cut pieces of wood to make a box frame around the mold, and nail the frame together. Put the mold and frame on a plastic sheet, fill them with cement, and let the cement dry. Remove the cement mold from the frame, coat the inside of the mold area with silicone rubber, and once dry, fill the mold with cement. 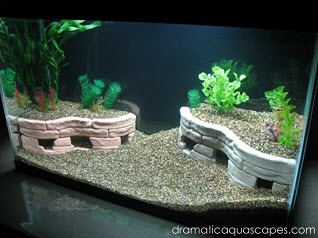 Remove the dry cement from the mold and let it rest for about a month before putting it in your aquarium.